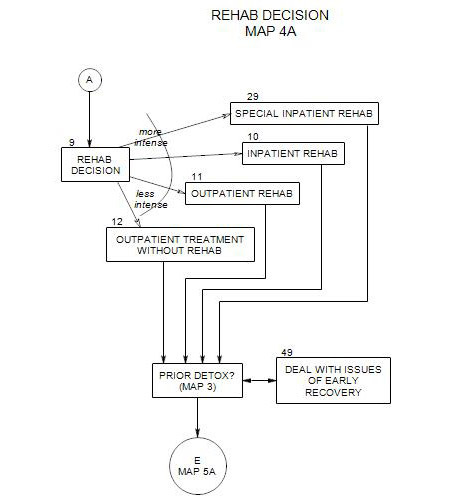 This is a continuation of Map 2, if the person was physiologically dependent, or Map 3 if the person was psychologically dependent or abusing alcohol. In rehabilitation, the person learns to manage his/her psychological dependence on alcohol. The heart of the map is Section 9, where you decide on the kind of additional treatment: inpatient rehabilitation [Section 10], a dual diagnosis program [Section 29], outpatient rehabilitation [Section 11], or outpatient treatment without rehabilitation [Section 12]. The last two boxes on the map are for patients who were physiologically addicted. Section 49 discusses their special difficulties and treatment approaches that can be helpful to them. Continued therapy issues and choices are considered on Map 5A.